Open Box item. Customer return in new condition. Board is still in original unopened antistatic bag. Includes power supply. Defaults to 4MHz to support Arduino Uno shields. sing the board. Warning: The voltage applied to this pin must be a regulated 5V supply	otherwise it could damage the Galileo board or cause incorrect operation. For Galileo it is not possible to change the upper end of the analog input range using the AREF pin and the analogReference() function. Check out the Audio Sample Sequencer tutorial of the project that Arduino Verkstad brought at the Maker Faire Rome at the Intel Galileo Booth. Galileo has a number of facilities for communicating with a computer, another Arduino, or other microcontrollers. Galileo provides UART TTL (5V/3.3V) serial communication, which is available on digital pin 0 (RX) and 1 (TX). In addition, a second UART provides RS-232 support and is connected via a 3.5mm jack. The USB Device ports allows for serial (CDC) communications over USB. This provides a serial connection to the Serial Monitor or other applications on your computer. It also enables Galileo to act as a USB mouse or keyboard to an attached computer. To use these features, see the Mouse and Keyboard library reference pages. The USB Host port allows Galileo act as a USB Host for connected peripherals such as mice, keyboards, and smartphones. To use these features, see the USBHost reference pages. Galileo is the first Arduino board to provide a mini PCI Express (mPCIe) slot. This slot allows full size and half size (with adapter) mPCIe modules to be connected to the board and also provides an additional USB Host port via the slot. Any standard mPCIe module can be connected and used to provide applications such as WiFi, Bluetooth or Cellular connectivity. Initially, the Galileo mPCie slot provides support for the WiFi Library. 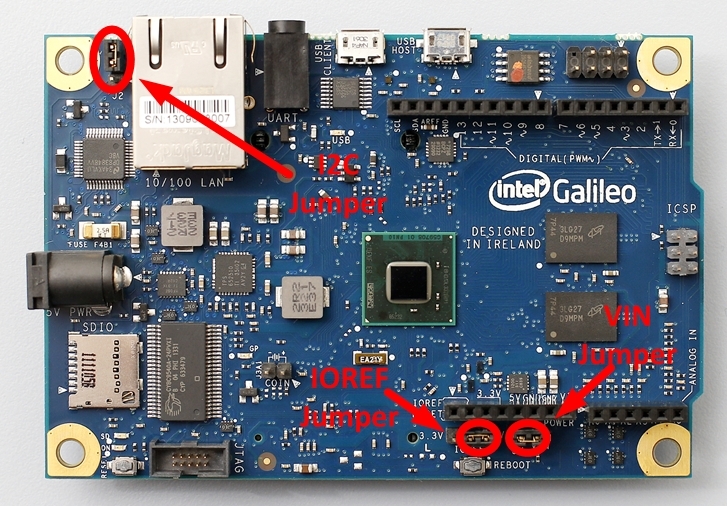 For additional information, see the Intel® Galileo Getting Started Guide. An Ethernet RJ45 Connector is provided to allow Galileo to connect to wired networks. When connecting to a network, you must provide an IP address and a MAC address. Full support of on-board Ethernet interface is fully supported and does not require the use of the SPI interface like existing Arduino shields. The onboard microSD card reader is accessible through the SD Library. The communication between Galileo and the SD card is provided by an integrated SD controller and does not require the use of the SPI interface like other Arduino boards. The Arduino software includes a Wire library to simplify use of the TWI/I2C bus; see the documentation for details. For SPI communication use the SPI library. Galileo can be programmed with the Arduino software (download). When you are ready to upload the sketch to the board, program Galileo through the USB Client port by selecting "Intel Galileo" as your board in the Arduino IDE. Connect Galileo's port labelled USB Client (the one closest to the Ethernet) to your computer. 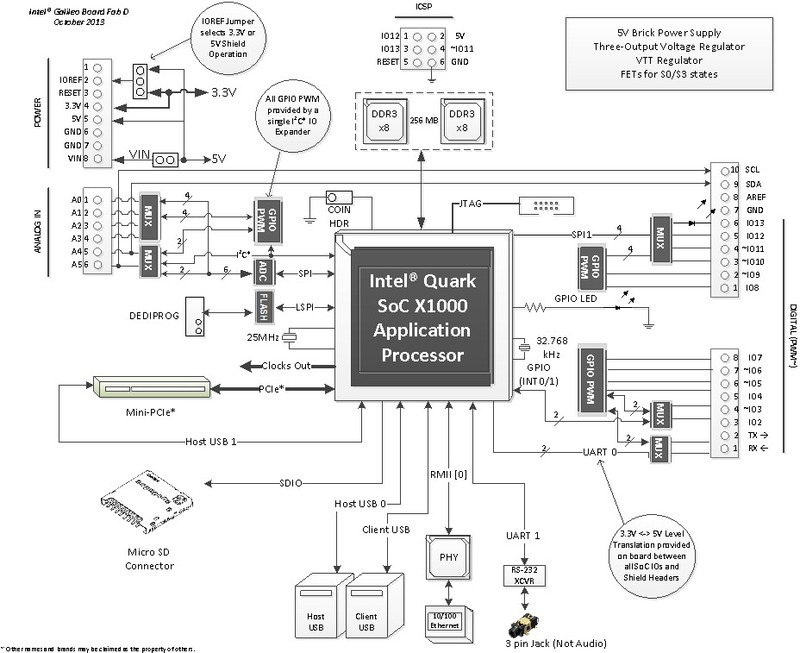 For details, see the reference, tutorials and Intel® Galileo Getting Started Guide. Rather than requiring a physical press of the reset button before an upload, Galileo is designed to be reset by software running on a connected computer. Warning: The IOREF jumper should be used to match the board and shield operating voltages. Incorrectly setting the voltage could damage the board or the shield. I2C Address Jumper To prevent a clash between the I2C Slave address of the on board I/O expander and EEPROM with any external I2C Slave devices, jumper J2 can be used to vary the I2C address of the on-board devices. With J2 connected to pin 1 (marked with white triangle), the 7-bit I/O Expander address is 0100001 and the 7-bit EEPROM address is 1010001. Changing the jumper position changes the I/O Expander address to 0100000 and the EEPROM address to 1010000. VIN Jumper On Galileo, the VIN pin can be used to supply 5V from the regulated power supply connected at the power jack to attached shields or devices. If there is a need to supply more than 5V to a shield using VIN then the VIN jumper should be removed from Galileo to break the connection between the on-board 5V supply and the VIN connection on the board header.